Sabetha, KS - Sabetha Community Hospital's Outpatient Diabetes Education Program has recently renewed its status as an accredited Diabetes Education Program by the American Association of Diabetes Educators. This allows residents in and around Nemaha County increased access to critical diabetes education services. The Sabetha Community Hospital Diabetes Education Program offers individual sessions to assess individual needs to help develop a collaborative plan that works best for each client. The program will offer group classes periodically as well. To learn more or schedule an appointment, they can be reached at (785) 284-2121, Ext. #419. "Diabetes can be a challenging disease to mange, and the results of uncontrolled diabetes is staggering. Diabetes education is such a practical key to empower clients with resources, tools an support to help them reach their goals," states Lori Menold, RN, CDE, Program Coordinator at SCH Outpatient Diabetes Education Program. "Trends show that diabetes education is moving out of the hospital and into the community, so AADE's accreditation program was created, in part, to encourage diabetes education where the patient is seeking care," said Leslie E. Kolb, RN, BSN, MBA, Program Director, Diabetes Education Accreditation Program. 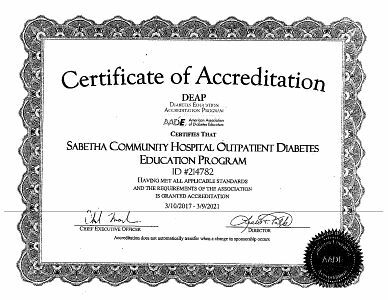 "Sabetha's Outpatient Diabetes Education Program is exactly the type of program we envisioned when we set up accreditation program in 2009."